report by Mike Treen, Unite general secretary. Reprinted from The Daily Blog. Fightback analysis to come. 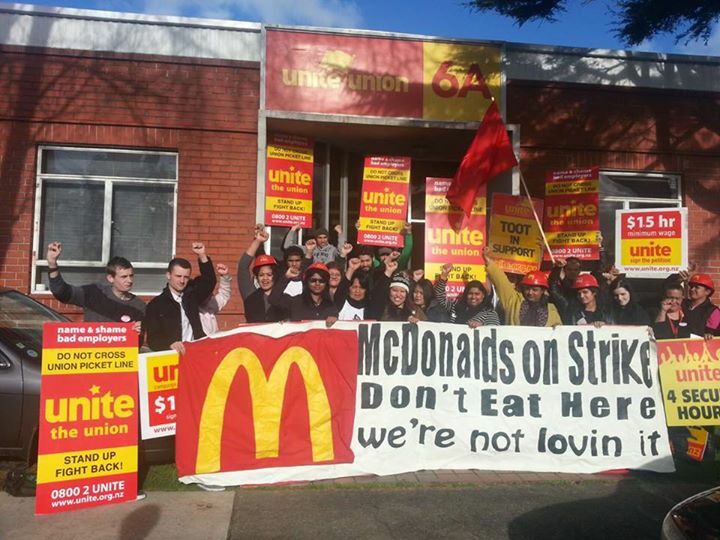 Unite Union is in the process of ratifying a new collective agreement with McDonald’s that is a significant step forward in getting improved security of hours for that company’s 9500 employees. It comes after negotiations broke down at the end of April and four months of action by members and supporters at stores around the country. The new fairer rostering clause is the most important change in the agreement and applies to all members. The power to roster someone or not is the most important weapon for controlling and disciplining the workforce. The new clause affirms the the importance of “rostering employees fairly and reasonably”. It says that “Where additional hours become available in a restaurant current employees will be offered additional shifts before new employees are employed.” There is an added obligation that “additional shifts will be notified to employees on the crew notice board”. When hours have to be reduced in store then the reduction “will be uniformly applied” so they can’t cut just some members shifts while other stay the same or even get more. The obligation to “share relevant information” is an important obligation as it has often been difficult in the past to get information from the company regarding rosters and hours in a store. The company has also committed to stronger education of managers and monitoring and enforcement measures, including the issue in crew questionnaires and posters in store explaining the policy and the escalation process crew can use if they aren’t happy. All union members who joined before April 29 (when negotiations broke down) will receive a special payment when this agreement is ratified. Nonunion staff do not receive this payment. In return for this payment the union agrees to allow the company to pass on the terms and conditions to nonunion staff. The amount paid depend on the average hours worked in the previous 8 weeks. Union members who work over 30 hours on average get $200 (gross). Union members who work 21-30 hours on average get $125 (gross). Union members who work 20 hours or less on average get $100 (gross). An important part of the new agreement is ensuring that the current legal obligations to provide breaks (which is being repealed by the government) is maintained. The company had also wanted to go back to a 10-minute rest break. Unite has been able to get the legal rest break of 10 minutes increased to 15 minutes in all its collective agreements. The new clause ensures a 15 minute paid break in the 3-hour minimum shift. The 30 minute unpaid meal break is required for working more than 4 hours and a second 15 minute break kicks in for working more than six hours. This is the first time it has actually been in the agreement that the second rest break must happen for working more than six hours. Workers will be compensated an additional 15 minutes pay is they miss a rest break. We believe workers should also be compensated for missing the meal break but the company and union are in dispute on that issue with differing interpretations of a clause in the old collective agreement and will probably end up in court over the issue. If we are successful workers could be owed several million dollars. In this agreement we included a clause that the union had the right to seek a penalty and compensation for individual workers if they miss their meal break. The company has also committed to doing a more thorough auditing process of stores to ensure compliance with the breaks clause. The wage increase is modest and constrained by the 25 cent an hour minimum wage movement. This was increased to at least 30 cents an hour for most workers but McDonald’s still remain behind rates paid at KFC – a gap which we had hoped to close more. There were other small improvements around training being available to everyone within three months of starting and the higher rates that result from completing the training to apply from the date their books are submitted. The agreement also spells out that no one can be forced to work outside their availability – especially overnight shifts. The new collective agreement will also be made available to all new staff with a membership form attached for those who want to join the union. The collective agreement itself has been radically rewritten to make it make more user friendly and is now half its previous length because a lot of company propaganda has been removed. The on-line vote on the new collective agreement is currently running at 90% in favour so it seems that the members agree that the agreement offers us an opportunity to push back against the casualisation that has marked the fast food industry since the deunionisation of the industry in the early 1990s. In 2003 when Unite Union decided to start reorganising some of the sectors of the economy that had largely lost union representation and collective agreements we were horrified at the prevalence of what overseas has been dubbed “zero-hour contracts”. Most of the workers we represent today in fast food, movie theatres, security, call centres, and hotels had individual employment agreements that had no guaranteed hours. Workers also rarely got their proper breaks – especially in fast food. In the UK the fact that an estimated one million workers are on zero hour contracts has become a national scandal. In the USA there is the beginnings of a widespread revolt against insecure hours and low wages with nationwide strikesplanned for yesterday. Whilst we haven’t eliminated those problems we have introduced clauses in all the main agreements that affirm the right to secure hours and constrain the employers right to hire new staff before offering the hours that are available to existing staff first. Each new collective agreement has tightened up on the clauses to increase the protections. With the most recent Restaurant Brands agreement (covering KFC, Pizza Hut and Starbucks) and now the McDonald’s agreement we have included clauses that demand the sharing of information with members and the union when disputes over staffing and rostering happens. We think this will significantly strengthen our position when we get into arguments over whether the company is actually complying with its obligations under the collective agreements. However Wendy’s is the only company we have an agreement for guaranteed hours for crew after 2 years service. It is probable that the percentage of workers on zero hour contracts in New Zealand is larger than the UK. The labour movement as a whole should be making the issue a national scandal in this country. In 2015 Unite will be renegotiating the major fast food contracts with the goal of moving from secure hours to guaranteed hours for most staff.